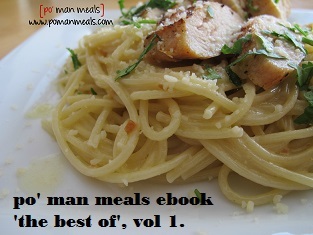 po' man meals - my books! available in different formats including hardcover, softcover and ebook my latest cookbook is here! it is full of po’ man meal favs and more importantly has exclusive recipes that have never been published online. a collection of over 25 po’ man meals favorites in one ebook. recipes types from breakfast, appetizers, sides, meals, and desserts that are affordable, low cost meals for your family. they are all easy to make and can be put together quickly! you be quickly understand why these are some of our readers favorites, and for only $2.99! 7 responses to my books! I think publishing your cookbook is awesome, but I can’t seem to find a) price or b) way to order hard or soft cover. I am having trouble as well…. would love to get one, but the connection isn’t happening. I LOVE your e-BOOK!!! Will buy your next one, too! Thank you for sharing your love of food and family with us. All the best to you and yours and lots of success with it! !